Effectively incorporating new employees can be a challenging task for HR and managers alike. Back when the majority of new hires were expected to stay with the company for the long haul, traditional orientation programs consisted of a brief introduction to the company and a lot of paperwork. Now, today’s new generation of workers is looking for more than just a job and workers are not afraid to job hop until they find the right fit. In a recent survey by Korn Ferry, 90% of executives said retaining new hires is an issue in their company with the majority reporting turnover rates of 10-25% within the first 6 months alone. No surprise then that only 9% of HR managers in a 2014 survey believe their onboarding process is fine as is. In fact, 43% went so far as to agree that “time and money are wasted because of ineffective onboarding processes.” That wasted money could amount to more than $10k a year, said 45%. Today, a list of tasks and responsibilities is simply not enough to give employees a robust understanding of a specific role within the company. While orientation programs are a popular component to effective onboarding, gearing them toward a realistic understanding of their role can help them adjust quickly and confidently. Incorporating formal and informal training in the integration process enhances employee clarity and confidence, while connecting them to long term employee development allows them to envision a future at the organization. An Allied Workforce Mobility Survey found that only 58% of companies provide clear job titles and identify expectations for employees. Furthermore, only 39% establish milestones and set goals for new employees. In the past, onboarding mainly involved communicating factual information about pay and benefits, reviewing company rules and procedures, and completing paperwork. However, today it’s important that the onboarding process also focuses on the expectations and key skills the employee is expected to possess. When the HR team plans an orientation program, they should set the objectives for the process. Outline specific skills and key competencies the role might require, set out examples of how the new hire will achieve these objectives and measure the outcome. Employees who have clarity regarding their roles will have a greater onboarding and company success than those who do not. A well planned, well timed and well-structured approach to creating clarity will benefit in three ways: Increased employee engagement, improving performance and reduced turnover rates. Many years ago, Texas Instruments, a manufacturer of electronics and semiconductors, realized it was missing its yearly performance targets. Instead of focusing on increasing efficiencies on the production line, the company looked to clearly define what was expected from new hires. The company compared new hires who went through the onboarding process to those who did not. TI discovered that those who spent time understanding their roles were fully productive two months earlier. The study also found that employees were two-thirds more likely to stay with the company for at least three years longer. On the first day of onboarding, the new employee is given a clear outline of what is required of them and how they should go about achieving their objectives. What’s more, the employee is given a date as to when he or she should meet these objectives. Each co-worker sits with the new employee for the first week, to fast track through the onboarding process as quickly as possible. In a slow growth economy, companies tend to take a much more pragmatic approach to hiring – filling the holes where there is the greatest need. 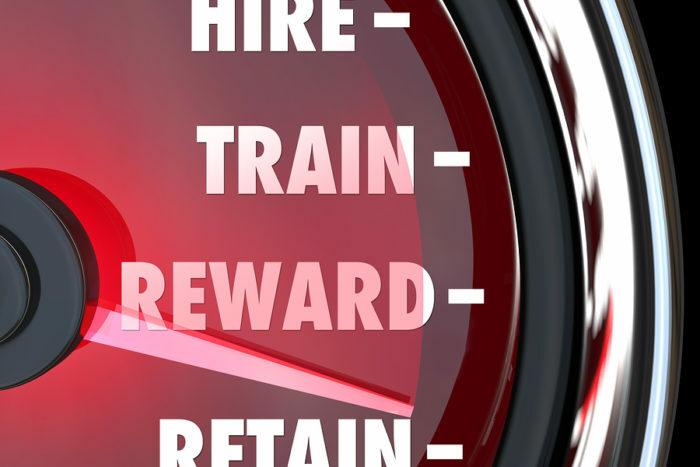 Accelerating the assimilation of new hires so they are contributing effectively in the shortest amount of time becomes the most urgent need. Organizations have much more at stake when new hires don’t meet expectations and fail to add value. Money, time and resources have been spent during the recruitment and hiring process, making it essential to ensure the retention rate remains high. Clearly defining what the new hire should be doing is the cornerstone to a successful onboarding process, and for developing an effective workforce in the future. It’s not only HR that’s involved in the onboarding process. Managers must play a key role in guiding new hires and making them feel confident in their new position. Therefore, building a strong manager-employee relationship is one of the most important parts of the onboarding process. However, a survey by ALEX Asks revealed that regardless of whether an official onboarding process was in place, less than half of new hires received formal written feedback from their managers within the first 90 days. Without a manager that can effectively deal with new arrivals, the new employee lacks engagement and does not adapt well to both what is expected of them and what they expect from the company. The costs of new-hire turnover can be immediate and significant. Calculating the business impact covers many components, including the cost to hire a replacement, cost of on the job training and lost time for the manager overseeing the new employees’ hiring process. It is therefore imperative that once the employee arrives at the company, the coordination between the new manager and the new hire is as efficient as possible. Managing can be straightforward, listing the processes the employee is expected to achieve can be an easy task. However, dealing with people is a soft skill managers need to possess. Orientation is a key component to the onboarding process that introduces the new employee to the organization and to the people in his or her work unit. During the orientation process the new employee must meet the CEO, the HR manager and the direct supervisor/managers in the first couple of days. From an early stage, communication is key. As soon as new hires join the company, managers need to discuss exactly what they expect from their new arrivals. They should be clear about what duties are important to the company and how success will be measured. Managers should initiate feedback conversations with new hires regularly during the first few months on the job to share information about the company, the role, and the culture. Managers must ask questions to confirm the new hire’s understanding of the information and uncover any concerns they may have. According to Aberdeen Group, 86% of new hires make their decision to leave or stay within the first 6 months. Among the reasons those who quit cite is a lack of appreciation. PepsiAmericas, the world’s second largest bottler of Pepsi, created an onboarding process that included manager training. The new process focused on using recognition earlier and on a continuous basis. The 20,000 employee company found that 46% of those leaving the company did so in their first year. To start off the onboarding process, every new hire received a key chain, symbolizing the vital part the employee would be playing in the company’s success. The award is presented to the new hire by their manager. By meeting the need for recognition on day 1, the company reinforces the hire’s decision to join the organization, and builds a connection with their manager and with the whole company. Often new employees fail at their new jobs because of a poor culture fit. Integrating new hires into the organization’s culture requires a strategy to ensure employees learn about the culture and the history of the company. It’s critical to make the employee feel and emotionally connected to the organization beginning even before they step in the door. When new hires arrive at a company they are seeking to understand both the organization’s informal culture and formal expectations, so it’s imperative to take advantage of this opportunity from the get go. The onboarding process can be seen as an extensive team building exercise, with new employees bonding with their colleagues as quickly as possible. By making the onboarding process as personal as possible, new employees can not only understand what the company culture is, but how to thrive in it. Tech giant, Red Hat, brings every new employee to its headquarters for an intensive multi-day program. They are introduced to the company’s brand book, are introduced to a variety of employee “ambassadors” and given a red Fedora, the company’s trademark symbol. As the Forbes article explains, the company inculcates its brand and values into its onboarding, introducing the new hire to the company’s culture right from the start.